Endometriosis is a risk factor for ovarian cancer and affects approximately 1% of ovarian endometriomas. Epidemiological findings suggest that severe menstrual pain was associated with an increased risk, with a strong association between endometriosis and the clear cell/serous borderline histologic ovarian cancer subtypes. These observations suggest endometriosis as a potential cause of ovarian cancer; however, little is known regarding how endometriosis evolve to become malignant. Multiple lines of evidence have shown that the adaptive immune system and thrombo-inflammatory response are crucial in driving the pathogenesis of endometriosis. T cells, NK cells, and inflammatory cytokines seem to participate in the development of endometriosis by suppressing the immune response and favoring the establishment of endometriosis. These factors are also known to influence the outcome and metastasis of high-grade ovarian cancer. Therefore, we hypothesize that T and NK cell population and the inflammatory microenvironment of endometriosis can contribute to a malignant occurrence in endometriosis patient. Our study aims to understand the roles of inflammatory cells and activated platelet in a rare collection of endometriosis lesions with the accompanied tumorigenic transformation. In particular, we will characterize T and NK cell population subsets and examine inflammatory mediators including platelet status and cyclooxygenase-2 (COX2) level in this unique microenvironment. With this new knowledge, our goal is device molecular tools for clinical practice to distinguish endometriosis that have a high potential to turn cancerous and be detected earlier. 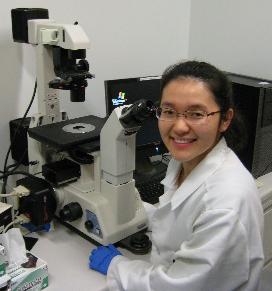 Dr Yu Yu graduated in Medical Science (Pharmacology and Biochemistry) from the University of Sydney. She was trained in anti-cancer therapeutics development in the Molecular Pharmacology and Pathology laboratory at the same institution, where she gained a PhD in Medicine (2011). Her postdoctoral training has been conducted in the TeLinde Gynecologic Pathology Laboratory at Johns Hopkins University School of Medicine (United States), with a focus on treatment for recurrent ovarian cancer.